Skincare--What's in My Beauty Bag? With spring now officially here and summer on the way, skin starts to really be in focus. The makeup trend for the warmer months is the glow of the Beach Bombshell and the California Girl--shown here by the beautiful Kate Bosworth--and the first place that glow starts is with flawless skin. Fortunately there are many wonderful products out there, but often times the sheer number can be a bit overwhelming. It's also often a question whether you need to spend a lot of money in order to get a product that really works. Happily, I can tell you that great skin does not have to be expensive. I'm a huge fan of drugstore products, which are just as effective as many of their more expensive counterparts. 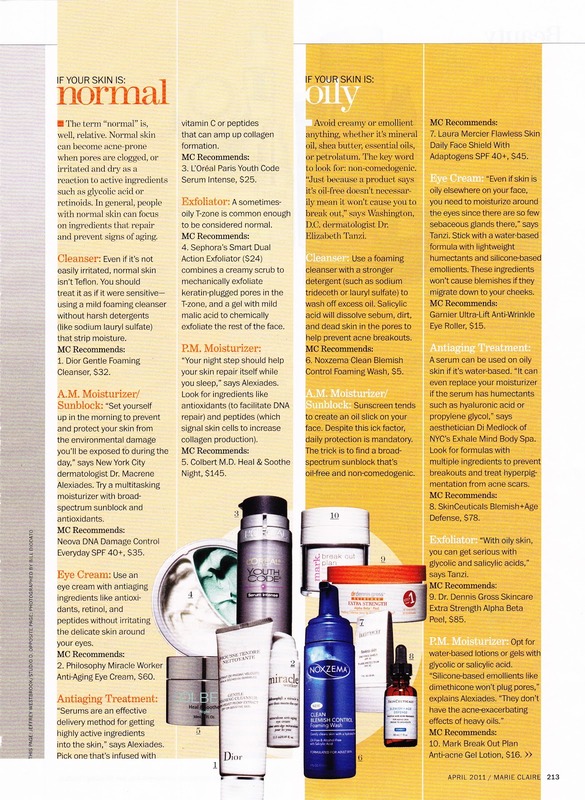 Dermatologists agree and many their favorites regularly come from the drugstore as well as the department store. 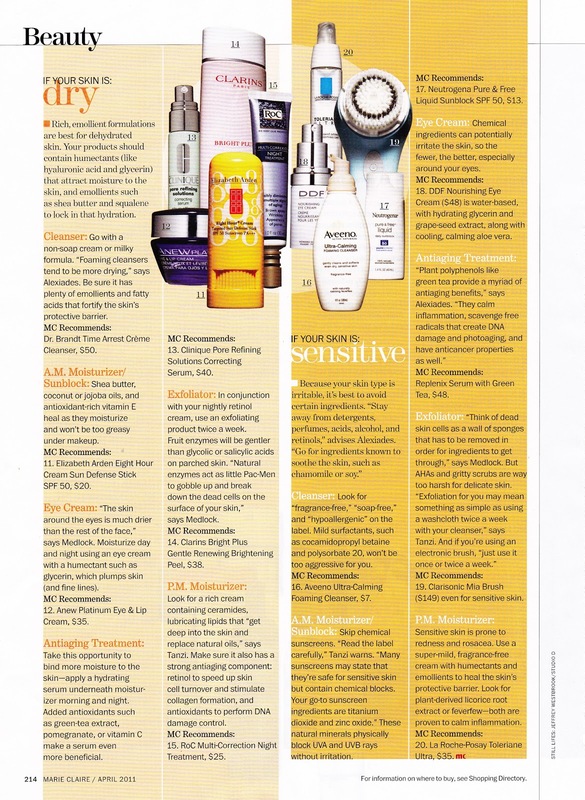 You can see their picks from April's Marie Claire at the end of this article. 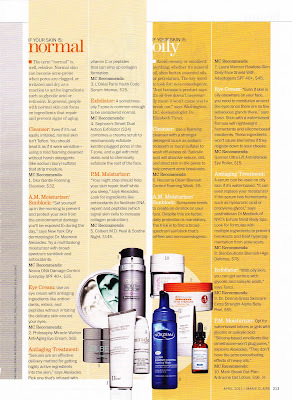 Some of my own favorite skincare products directly from my beauty bag are shown below. I'd love to hear about your favorites as well! 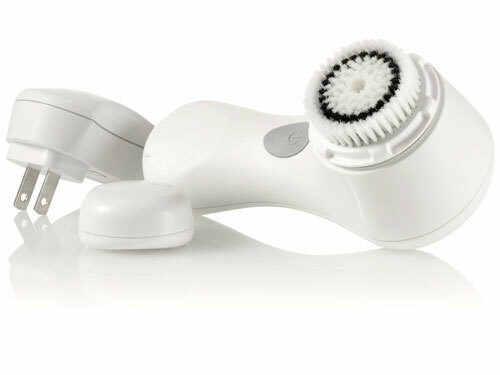 The Clarisonic Mia makes any cleanser work better. It works with the same type of technology as your electric toothbrush and I promise you'll notice a difference in your skin after the first time you use it. Like a gentle exfoliation each time, it lifts much more makeup and dirt from your pores than just a cleanser alone. Cordless (rechargeable) and waterproof, you can keep it in the bath or shower and is also great for travel. If you're looking for a less expensive one from the drugstore, Olay now carries its own version of the ever popular Mia. After my favorite cleanser was discontinued, I looked around for its replacement and never imagined I'd find a cleanser I liked better. 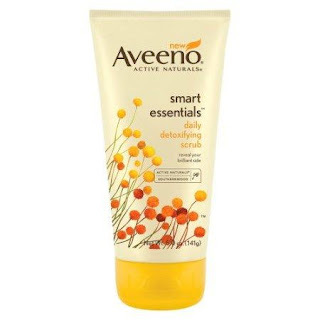 Aveeno's Smart Essentials Pore Purifying Facial Wash is just that and a dream for all skin types, particularly my sensitive skin. It's soap free yet somehow effectively removes every trace of your makeup. Unlike other cleansers, though, it won't strip your skin in the process. Normally I stray from "soap free" cleansers because I like my skin squeaky clean, but this one magically acts like a gel cleanser while treating your skin like a cream. Exfoliation is a step that's key to maintaining younger looking skin. 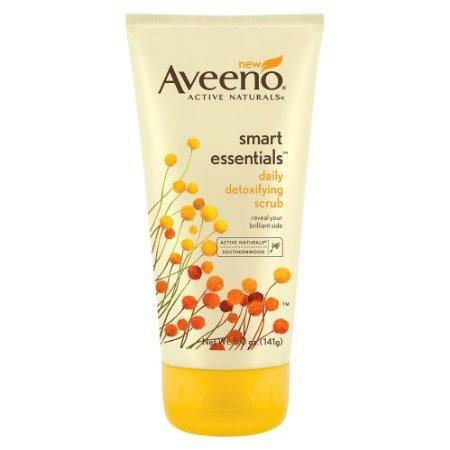 The companion to the Facial Wash, Aveeno's Smart Essentials Daily Detoxifying Scrub is just as gentle but just as dynamic as well. Keeps skin healthy by sweeping away dead skin and debris to reveal a silky smooth complexion. An additional tip? Wash your hands with this scrub after using self-tanner and you'll never suffer from orange palms again. I have never been one to enjoy wearing SPF every day. 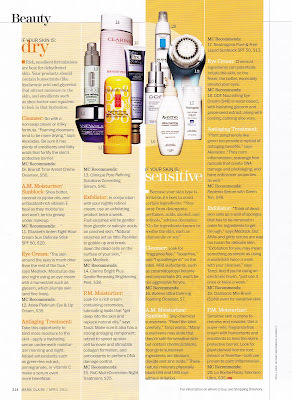 Most daily lotions have chemical blocks in them that bother my sensitive skin. And even those with physical blocks are at best tolerated by my skin, and then I can't wait to get them off at night. 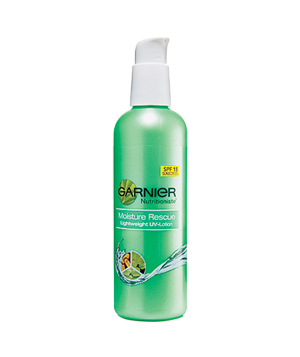 A breakthrough product, Garnier's Moisture Rescue Lightweight UV Lotion is the first SPF product that I actually look forward to putting on my skin every day. It's so incredibly cooling and soothing that my skin feels better after I've put it on. It also makes your skin look positively luminous. I often leave my house with only this lotion and maybe a bit of concealer. If you were looking for a product to improve your SPF habit, this is definitely the one to try. With sensitive skin, using retinol at night has normally been an absolute no-no for me. 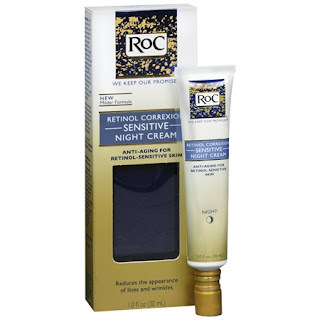 Yet with ROC's Retinol Correxion Sensitive Night Cream, I've finally been able to enjoy the anti-aging benefits of retinol without any of the irritation, redness, and dryness. The time-release formula is so effective that my skin has actually adjusted to retinol and can now even tolerate more intense doses of it in other products. But I still rely on this formula the most, which is a lovely light lotion with plenty of moisturization for my skin. This line has an retinol eye cream that I love as well. Some days and nights I like to give my skin a break from work horses like SPF and retinol, and lately I've been turning to L'Oreal's Youth Code Day/Night Cream. Super soothing, the cream contains cutting-edge peptides that help to repair your skin--it's one of the first to address your DNA and actually reverse some of the signs of aging--and probiotics that help your skin glow. It also moisturizes your skin like a dream. And if you want even more anti-aging punch? 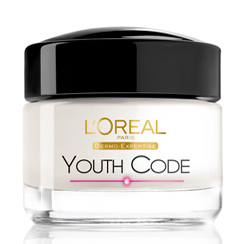 The Youth Code line includes a serum and eye cream that are equally as effective. I've got them all in rotation depending on the needs of my skin. I'm going to buy all this stuff right now!Only cause YOU look so amazing! Thanks for sharing!